Specially designed for wearing overnight, to help relieve the symptoms of Plantar Fasciitis (tightening to the ligament between heel and toes) as you sleep. 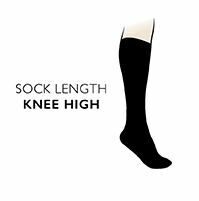 The 1000 Mile Ultimate Plantar Fascia Single Sock is a beneficial knee high sock with an adjustable Velcro cuff and D-ring-based strap system between toe and cuff that permits control over the level of prolonged dorsi-flexion (pulling the toes back up towards the knee) required by the wearer. The pulling action causes the under-foot plantar fascia to stretch for a sustained period, encouraging the ligament tissues to repair and heal in a better, more natural position, helping to reduce plantar fasciitis and related heel pain. The spandex-enhanced, support level 3 fit minimises bunching and provides a ‘tailored’ fit.